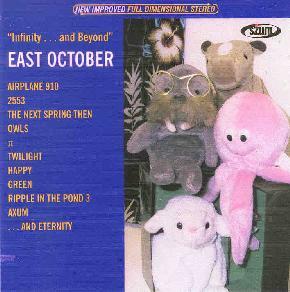 East October - "Infinity... and Beyond"
Though this is the first album from East October I've heard, I have heard a great deal of him from his participation as keyboardist for Automatic Music. Infinity... and Beyond is mostly dominated by avant-garde theater soundtrack type pieces with whimsical melodies, Italian restaurant accordion sounds, and mucho groovy collage styled chaos. Characteristic of this style are the tracks "2553", "Happy", and "Green". On "2553", one of my favorites, a Bluesy hillbilly banjo creates a down-home party atmosphere, but is accompanied by strangely contrasting eerie wails and drones. After a few minutes things start to get a bit more intense as the banjo retains the Blues sound but strays more into free-improv territory. A thudding bass provides a lo-fi Magma potency, rumbling machine sounds give the feel of an industrial surrounding, and various other strings and keyboards concoct a collage of melodies of all moods and styles. Lots happening here, and rather than trying to keep up I just enjoyed the oddball ride. "Happy" includes a brief "cover" of the Beatles "I Want To Hold Your Hand" which reminds me of how the Residents used to be asked if they hated the Beatles. Much of this seems to tell stories in a Residents Mark of the Mole style. It also tends to be a little too all over the place, but when it works it works well, and is well worth an attentive listen. A few tracks see East October exploring different territory. "Airplane 910" and "and Eternity" both consist of slowly shifting drones that will makes you feel like you're strapped to the wings of an airplane. "The Next Spring Then" is a cosmic trip with wailing space guitar and fluttering electronics. Like a mixture of Hawkwind and drone rock. A track that has the pie sign as its title plays a freaky form of cosmic trip-hop with pounding percussion and subtle ambient bits. And "Axum" is completely different, being a partying rocker with pounding rhythms, Bluesy slide guitar licks, and a demand to dance. Overall an interesting set. And the cover is a parody of the Beatles' Yesterday And Today, though the "regular" release (catalog #UNEN 3) is a play on the cover of Yesterday And Today that we all know, while UNEN 3 PRO is the promo version sent out and has a cover (pictured in this review) that parodies an unused cover for the original Yesterday And Today. For more information you can visit the Szum Music web site at: http://www.szum.com. Contact via snail mail c/o Szum Music; PO Box 4174; Archdale, NC 27263.